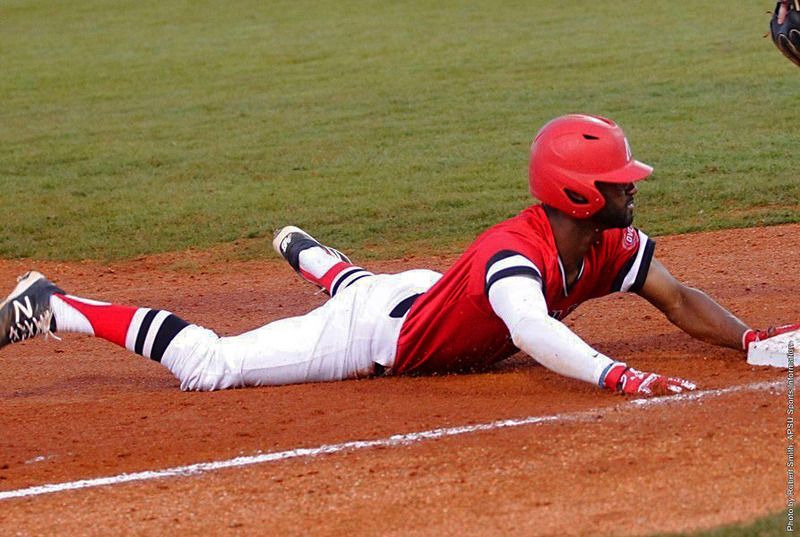 Clarksville, TN – It was another nine-run night for Austin Peay State University’s baseball team, but Indiana State rallied late to hand it a 12-9 loss, Sunday night, in the final game of the Riverview Inn Governors Challenge at Raymond C. Hand Park. The opening three innings were a quiet affair with the two teams scoring just three runs. The Govs held a 2-1 lead after those three frames thanks to first baseman Dre Gleason‘s two-run home run in the second inning. Indiana State (2-1) looked to take control of the contest with a four-run fourth inning. The Sycamores saw four of their first five batters reach base safely, with center fielder Tony Rosselli capping the burst with a two-run home run that gave the visitors a 5-2 lead. Austin Peay (2-1) did not let the Indiana State outburst go unanswered, rallying for four runs in its half of the fourth. An early ISU error helped the Govs cause early and catcher Parker Phillips capitalized on the miscue with a RBI single. But Austin Peay kept the threat alive, eventually loading the bases. Center fielder Imani Willis brought three runs home with a line drive triple that eluded the ISU defense, supplying APSU a 6-4 advantage. The teams traded runs in the fifth with the Governors scoring their run courtesy left fielder Cayce Bredlau‘s solo home run. Austin Peay built a two-run advantage thanks to a few Indiana State battery miscues. Phillips led off the inning with a single then moved to third on a pair of wild pitches before scampering home on a passed ball. Austin Peay would then go on to load the bases with two outs, but could not pad its lead further. That failure to pad the lead would come back to haunt the Govs in the final three innings. After the teams traded runs in the seventh inning, Indiana State broke through against the Govs bullpen in the eighth. The Sycamores got a leadoff triple from designated hitter Ryan Tolliver’s line drive to right center snuck past a pair of diving Govs outfielders. Left fielder Chris Ayers drove in the run with a one-out double and then scored on Dane Geisler’s two-run home run, a hit that gave Indiana State a 10-9 lead. Indiana State would tack on a pair of insurance run with a bloop single in the ninth to set the final score. Govs reliever John Sparks (0-1) was tagged for the loss after allowing the game’s final three runs on four hits and two intentional walks. Govs starter Caleb Powell was left no decision after allowing five runs on eight hits over 3.1 innings. Phillips paced the Govs offense with a 3-for-4, three-run scored performance. Willis went 1-for-3 with three RBI and added a sacrifice bunt in the sixth inning. Indiana State reliever Jeremy McKinney (1-0) picked up the win after tossing the final 3.2 innings and holding the Govs to one run on two hits. After the Sycamores gained the lead in the eighth, he retired five of the final six batters he faced. Shortstop Tyler Friis paced the Sycamores at the plate, going 4-for-6 with two RBI. Geisler went 3-for-6 with three RBI. The Sycamores pounded out 21 hits against the Govs, the most by an opponent since 2013. Centerfielder Imani Willis hit his third triple of the season when his line drive eluded the Indiana State defense. It came at a pivotal moment with the bases full of Governors and turned a 5-3 deficit into a 6-5 APSU lead. He also had a sac bunt and finished the game 1-for-3 with three RBI – his first RBI this season. The Govs posted another multi-home run outing, with left fielder Cayce Bredlau and first baseman Dre Gleason each driving their second home run of 2017. Gleason’s two-run, second-inning home run gave APSU a 2-1 lead. Bredlau’s fifth-inning solo shot broke a 6-6 tie. Parker Phillips made his first start at catcher for the Govs and made a nice pickoff play to help bring the fourth inning to a close. He also had a day at the plate, with three singles as part of a 3-for-4, three-run scored outing. Indiana State’s 21-hit barrage was the most by a Governors opponent since 2013. That season the Govs surrendered 23 hits in a 19-9 loss to Jacksonville State. However, that season turned out okay as the Govs went on to win a school-record 47 games and reach the NCAA Bloomington Region finals. Austin Peay concludes its season-opening four-game home stand when it hosts Southern Illinois in a 3:00pm, Tuesday contest. The Salukis swept a three-game series at Stetson to open their 2017 season.